Last night I watched the highly anticipated Game of Thrones premier on HBO. 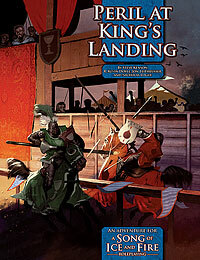 I am not a George R. R. Martin fan and only recently became aware of him from the 'A Song of Fire and Ice' Roleplaying Game (SIFRP) that was released a few years ago. For those with a deep love of fantasy and intrigue, this show looks promising indeed. I will not dissect the first episode, but I will say that it does not shun away from blood and gore. armor of the north men; Ravens used as messenger birds. Before the show, I journeyed to Half-price books to get out of the house and came across a copy of Peril at King's Landing, an adventure for the SIFRP. I have read through a third of it and it a nice adventure. It was nominated for the 2010 Ennie Awards for best adventure. Being of my own mind and opinion, I find the world of George R.R. Martin intriguing and refreshing, yet from a role-playing aspect, I only have one player that would invest the time into this type of setting. I look forward to more episodes of game of thrones, but fear I may never get to play the game.